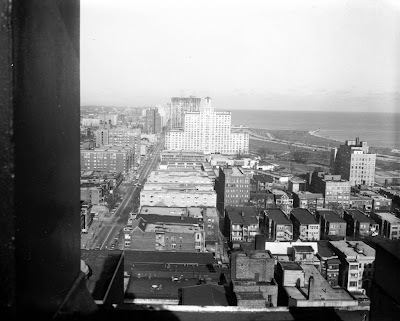 The main road at the left in this picture is Sheridan Road, looking north toward the former Edgewater Beach Hotel located near Sheridan and Foster Ave. The Trib had this identified as 1934, but a reader pointed out that can't be right because of the 4+1's and the Tides Motel visible. Anybody have a better date? One of the twin high rises at 5400 block of north Sheridan appears to be under construction. Would that place the picture in the early to mid-60's?